Given how often I have listened to this novel, I have struggled with reviewing it. Partly, it’s because so many other people have reviewed it and done so with more depth and eloquence than I am generally capable of. Partly because I have deep thoughts about it as I’m falling asleep and can’t remember any of them when I try to write this review. Just so you know, there is a much better review somewhere deep in my brain. As we all know, Simon Snow is a takeoff on Harry Potter. I haven’t read Fangirl, so I can’t speak to Carry On as a commentary on slash fiction. Someone else described it to me as a critique of Harry Potter, and I’m not really sure it’s that either. I saw it more as using a familiar setting to explore other issues. From this point, I’m going to talk spoilers, all spoilers, all the time. And I might go bullet point in style, because I have lost the capacity to form transitional sentences. The Mage is full of toxic masculinity. He is completely certain he is right and though he was generally ignored before he covertly arranged the attack on Watford, he is now the highest mage authority. He has no problem with sacrificing the lives of women and children to further his agenda. His agenda is more important than other people’s rights. Like Voldemort, he is defeated by a self fullfilling prophecy. Voldemort is so obsessed with defeating death that he creates his deadliest foe and gives Harry the powers he needs to end his life. The Mage is so obsessed with creating “the greatest mage” that in the act of creating Simon, he also creates The Humdrum. The Mage ignores the power of women or sees it as a resource to further his own agenda. Penelope and Simon kill The Mage when Penelope casts a spell forcing The Mage to listen to Simon, and Simon says, “Stop hurting me.” The Mage was so toxic, the only way he could stop hurting Simon was to die. Like Harry, it is Simon’s capacity to love and be loved that saves him. Ebaneza rejects the idea that her magical powers give her a destiny. She lives the life she wants to live, herding goats and mooning after that dryad. She exercises her autonomy by using her magic in all the small ways she wants. When her life and Agatha’s are threatened, she fights The Mage. Agatha refuses to be fridged, to be collateral damage. Like Ebaneza, she rejects the place in the magical world that she has been given. I have a hard time listening to Lucy’s chapters. I haven’t examined why that is yet. They make me sad. Simon and Baz have tried to be the good soldiers their fathers want them to be, but they like kissing better than fighting. I’m looking forward to Wayward Sons, coming out next year. By then I should have Carry On memorized. I don’t know what this says about me as a person or about the book. Um, that you’re both great? I saw it more as using a familiar setting to explore other issues. Your reading of the Mage is EVERYTHING. 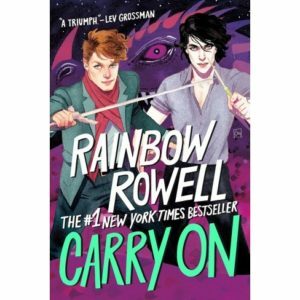 I am nervous about Wayward Son, despite having loved everything Rainbow has written. I do not know why. Euan Morton is in Hamilton? Cool! I haven’t listened to the audio of this book yet, but on my next read that was my plan. And listening to it every night is certainly a glowing recommendation. I mean I understand people use Harry Potter as an easy comparison for anythinf magical but Rowling didn’t invent the Chosen One, secret identities or boarding school narratives. I’m really happy to hear you don’t have a brain aneurysm. I love Euan Morton’s narration. He brings everyone to life. And thank you. I’m sure I’m not the first person to have those thoughts about The Mage.